For three hundred years, between the late 8th century and the late 11th century, Scandinavian invasions strongly influenced the course of historyin all of northern Europe and beyond. Vikings invaded the eastern side of Britain in the late 9th century and, for nearly one hundred years afterwards, this part of Britain was under the 'Danelaw'. At first these invasions brought violence and destruction but, over time, this changed. Peaceful trading replaced violence and Viking settlers became absorbed into local communities. They married local people and adopted some of the local customs. Local communities were influenced in turn by the culture and customs of the incoming settlers, creating an Anglo-Danish culture which set eastern England apart from the rest of Britain. The areas around the Baltic and the North Seas all share this Viking legacy which influenced the development of local cultures, including aspects of language, art and architecture. One architectural feature which most of these countries have in common is the use of the round tower in church buildings. How ancient are the round towers? 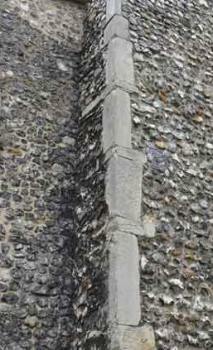 Many of the round towers in Norfolk incorporate easily recognisable Anglo-Saxon techniques such as triangular headed openings, long and short work and tall narrow openings. This has lead people to believe that the round towers pre-date the Norman Conquest of 1066. 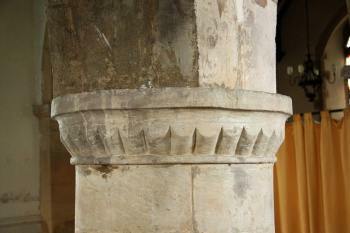 But these local forms and techniques are often found next to easily recognisable norman features such as scalloped capitals and billet moulding. It seems that the incoming French stonemasons and local masons combined techniques to produce a new hybrid form which lasted for up to eighty years after 1066. This new form is sometimes called the Saxo-Norman overlap. Until recently it was generally believed that church towers in Norfolk were built round due to a lack of good local building stone to form square corners. Recent research has questioned this idea. Several of the churches attached to round towers in Norfolk were built from a local stone called 'ferrugenous conglomerate' (type of dark brown stone formed from small pebbles bound in iron deposits) which could have been used to build square towers. Also, there are several examples of quare towered church buildings where large flints, rather than cut stone, have been used successfully. The technical problems involved in building a round tower linked to a square building were probably greater than the problems of building a square tower with difficult materials. Nevertheless, when people came to build these towers in the 12th century they chose to build them round. It seems likely that it was broader cultural reasons which guided this choice. When the round towers were being built the county probably had stronger links with the coastal communities around the Baltic and North Seas than it did with the rest of England. There were strong links, and a shared Scandinavian legacy, making it likely that Norfolk traders found they had a lot in common with people across the water. The earliest round towers date from the 10th century and were built in north Germany. The idea then appears to have spread along north European trade routes. Churches with round towers can be found in the north German regions of Lower Saxony and Schleswig Holstein, the Danish region of Skåne (now Southern Sweden), Norway (one example), and the Orkney Isles - all regions strongly shaped by Viking culture. It seems possible that the Viking descendants living in these regions were an important influence on the development of a new Christian architecture in stone. Round towers were first seen in East Anglia in the radiating chapels of Bury St. Edmund's Abbey from 1081 and, shortly after, at Norwich Cathedral. The idea was then adopted by smaller parish churches, along with the characteristic round double-splayed windows and other architectural details also found in north European churches. A more direct Viking influence can be seen in the ironwork on doors and in the sculptural forms found at some of the round towers. See the BBC Online history pages about the Vikings.